Blogs›Everest Base Camp Heli Tour in Spring – What to expect? Everest Base Camp undoubtedly tops all popularity charts in Nepalese trekking industry. Reaching the base camp of the world’s tallest peak is no ordinary feat. Standing at the base camp and enjoying the panoramic view of the peaks including the Everest is a dream come true for every aspiring trekker. However, trekking through the rugged and isolated trails leading to Nepalese Himalayans is more challenging than one might perceive. After all, an average trekking trail goes higher than the tallest peak in Europe, Mt. Elbrus (5,642m). However, overcoming the trials and tribulations of reaching the basecamp is not for everyone. Luckily, that’s where Everest Base Camp Helicopter Tour comes into the picture. Just like for expedition and trekking, there are favorable and less favorable seasons for Everest Base Camp Heli Tour. In this blog, we will guide you through the experience of undertaking this challenge in spring, the king of all seasons. One thing is always constant: the summit’s temperature never rises above freezing. While the Everest region’s temperature drops lower than -25°C in the winter, the weather gods are far kinder during spring. The temperature during day time clocks in at around 12°Cin daytime and lowers down to around 0°C in nighttime. It means that there are negligible chances of unexpected snowfalls and avalanches disrupting your journey, increasing the safety chances by manifolds. Also, you won’t have to wear quite a lot of layers of clothes underneath to keep you warm. Spring in Nepal is characterized by cloudless skies and flourishing environment. The days are quite long with over 7 hours of daylight. It is also the most favourable time of the year for helicopter rides to the Himalayans as the visibility is exceptionally clear. Thus, you can have the most outstanding views of the Everest, Mt. Cho Oyu (8,153m), Mt. Pumori (7,165m), Mt. Lhotse (8,501m), and Nuptse (7,864m). The other major advantage of undertaking this ride in spring is that due to clear skies and negligible chances of rain, the chances of encountering any unsolicited events during the flight are lessened highly. By now, you probably have understood the popularity of the spring season and the inevitable influx of tourists that follows. Like anywhere else in the world, here too, the price tends to go higher when the demand for the service goes higher. But before that, you should know that reaching the Everest base camp and returning within a few hours in the comfort of your chopper is a luxury, and luxury comes at a price. While the price differs from operator to operator, the average cost will range between USD $1200 to $1500 per person. Several factors like the availability of service providers, inflow of demand, number of people in your group, and the cost structure of your travel operator will come into play. If you approach any agency in a group, you are bound to get great discounts. Irrespective of the time of the year, we believe that you should have a clear idea about the itinerary so you can manage your plans and expectations in line with it. The day starts early at around 6am. Your chopper, which flies from Kathmandu to Lukla, will accommodate around 4-5 passengers. After the 30-minute-long flight, the aircraft will land at Lukla for a refuel. During the time window, you can have breakfast and go for a short sightseeing of the quaint town. From there, the helicopter will fly over Namche Bazaar and few other villages to finally land at the base camp. After spending some time here, you’ll be flown back to Kathmandu via Lukla. Some itineraries also include a visit to Kala Pathar, the best vantage point in Everest region. Make sure to discuss with your hosts beforehand if you want to include it in your trip. 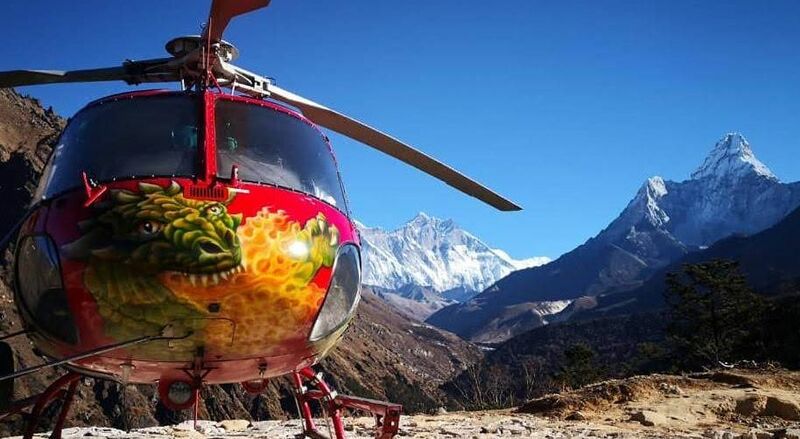 Heli Scams is a longstanding issue faced by the Nepalese aviation and tourism industries, but something that has only come to the surface now. Unfortunately, there are hundreds of unregistered agencies that are illegally offering these services. There have been instances where the companies use counterfeit bills and documents to make claims against the passenger’s travel insurance. Thus, make sure that you only choose a trusted and reliable operator for your journey!